If out-of-hospital cardiac arrest and outcome data is the topic, long is the list of research and passionate is the debate on every possible measurable outcome from pit crew CPR to methodology of compression delivery or the merits of load-and-go vs. stay-and-play. Another loved and frequently debated topic among prehospital enthusiasts is that of the prehospital airway: the provider, the device, the optimal time for airway management, it’s all fair game for a fight. Which can only mean that out-of-hospital cardiac arrest (OHCA) AND airway management is the dynamic duo of prehospital research and (BAM!) it’s been done not once, but twice, this month at JAMA, the Journal of the American Medical Association. Two trials hoping to answer this question: What is the best prehospital airway management strategy in patients in out-of-hospital cardiac arrest? Let’s take a look. (I’m writing as I read and I can hardly wait!) Note: Author has no particular preference or bias toward either paper. Chosen for review in the order taken from the printer. Here we go with the much anticipated AIRWAYS-2 trial1. Arguably this is one of the most anticipated trials in prehospital care. It’s been talked about for years and it’s now live and available to read in JAMA. 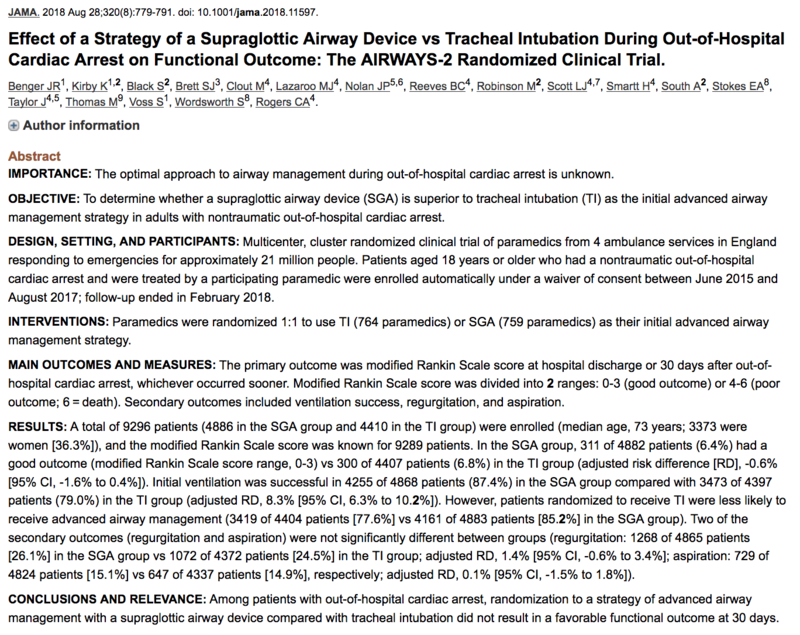 AIRWAYS-2 was a multicenter, cluster-randomized, clinical trial of UK ambulance services that compared the use of supraglottic airways and tracheal intubation in out of hospital non-traumatic adult cardiac arrest patients. This trial took place within 4 ambulance services, which combined provide service to 21 million people. Over a period of 26 months (June 15 to August 17), 9296 patients were enrolled and transported to 95 hospitals. Of the 3.3% of the patients who received advanced airways, AIRWAYS-2 found no significant difference in those patients assessed to have a favorable outcome (modified Rankin Score 0-3); with only 6.8% in the tracheal intubation group and 6.4% in the supraglottic airway group. Let’s switch gears for a sec over to PART2 and then come back to discuss how this applies to practice. 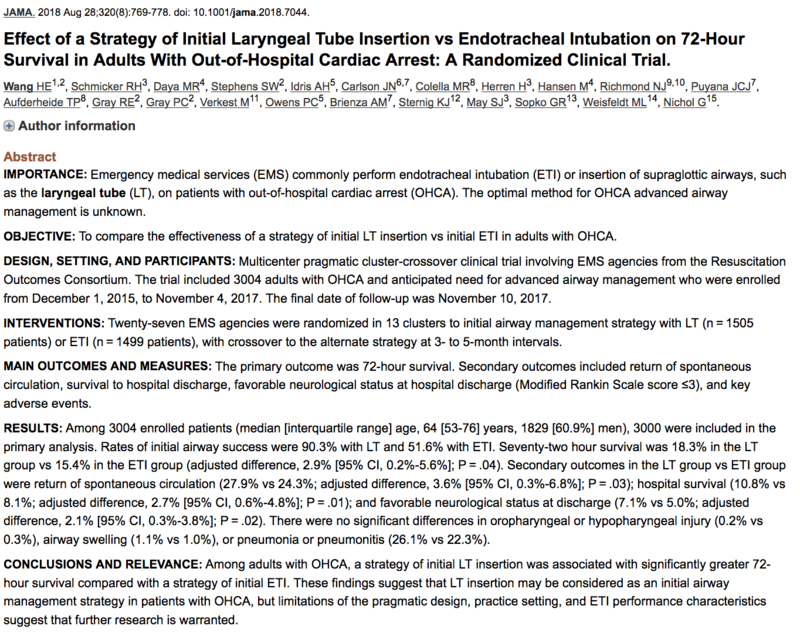 PART (Pragmatic Airway Resuscitation Trial) was a US multicenter pragmatic cluster-crossover clinical trial comparing the effectiveness of initial laryngeal tube insertion vs endotracheal intubation strategy in Out-of-Hospital Cardiac Arrest (OHCA). In PART, the inclusion criteria were similar to the previously discussed: adult non-traumatic OHCA patients who required airway management. EMS agencies were then randomized to laryngeal tube (LT) insertion or tracheal intubation (TI) and these clusters crossed over to between interventions during the trial period between 1 and 6 times. 3004 patients were included, divided almost in half for respective groups (1505-LT and 1499-TI). In this trial, the number of airway attempts was not defined by the study protocol and the primary outcome was patient survival at 72 hours post arrest. Results from PART conclude that the LT was “associated with modest but significantly greater” 72-hour survival than tracheal intubation meaning that there was 18.43% survival in the LT group and 15.4 % in TI group. That said, after the adjustment for the “intention to treat” population there was not a statistically significant difference. Well there wasn’t much difference, but there are plenty of considerations. The study authors pointed out that the paramedics assigned to TI were less likely to use an advanced airway than those assigned to the LT. The time to first airway attempt was 2.7 minutes shorter in LT than in the TI group. They also achieved initial ventilation success more often but resulted in twice as many “unintended losses of established airway” and additionally experienced regurgitation and aspiration more commonly than the TI group. In PART, I found it interesting that their intubation success rate was 51%, which is significantly lower than meta-analysis data3 and my own service’s data. According to the paper’s author Dr. Wang, on the FOAMFrat Podcast4, all of the failed airway attempts were rescued by the LT and he agreed that it is pragmatic to do so when the airway is difficult. He also noted, and his sentiment echoed by Dr. Jarvis (US EMS Medical Director), that prehospital agencies in the US have a difficult time getting the training time and number attempts to be successful with DL. ⁦@DrJeffJarvis⁩ ⁦@DitchDoc14⁩ ⁦@henrywangmd⁩ @christifulli88⁩ and Dr.Benger(Not a Twitter fan) all on one podcast discussing PART & AIRWAYS 2. As a Division Chief in prehospital care, I am always questioning, what does all of this mean for my first response and critical care crews taking care of patients? Both trials indicate that there isn’t a significant difference in choice of advanced airway so I guess we just proceed along without reflection on our current practice or how this data applies to us, right? These were large, well organized studies, but to me, they translate into validation of our operational guidelines. Is it possible that lack of confidence in skill or fear of poor performance was the rationale? Does this reflect inadequate training and familiarity? And were the volunteers in this study reflective of our own practitioners? Or is it possible that in cardiac arrest the scene is so hyper-dynamic that human factors play a massive role and clinicians can’t manage the cognitive load that is required during cardiac arrest. There are some great reviews out there already in the FOAMed world and you should check out these (and others we may have missed). Happy to hear your thoughts..
Podcast 57 – Straight From The Author (PART & AIRWAYS 2) | Critical Care | United States | FOAMfrat. Critical Care | United States | FOAMfrat. https://www.foamfrat.com/single-post/2018/08/29/Podcast-57—Straight-From-The-Author-PART-AIRWAYS-2. Published 2018. Accessed September 2, 2018. AIRWAYS-2. The Resus Room. http://theresusroom.co.uk/airways-2. Published 2018. Accessed September 2, 2018. Spiegel R. EM Nerd-The Case of the Needless Imperative. EMCrit Project. https://emcrit.org/emnerd/em-nerd-the-case-of-the-needless-imperative/. Published August 31, 2018. Accessed September 2, 2018. The Great Prehospital Airway Debate. Emergency Medicine Literature of Note. http://www.emlitofnote.com/?p=4271. Published August 31, 2018. Accessed September 2, 2018. Next: Next post: World Sepsis Conference: #wsc18 an Online, Free, #FOAMed style conference this week. 5th/6th September. 51% success rate for ETI is a damning statistic by any measure. I find it difficult to understand how such low rates of success for a procedure warrant its continued use. It would be interesting to see what the complication rate in the 49% of successful ETI’s was.